Are you looking tired every day? It all starts with - a good nights sleep of course, but it goes further than that. Caffeine - constrict blood vessels and reduce dark circles. Ruscus aculeatus root extract - fades dark circles, shrinks pores. Chenopodium quinoa seed extract - emollient, antiaging. Squalane - highly emollient antioxidant. Hyaluronic acid - hydrating. Holds 1000x its weight in water! Men, eye care should "traditionally" start when you are in your 20's, but no matter what ... ahem, age you are now, it should be something you use every day. 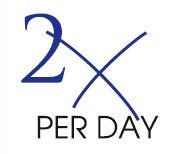 Two times per day actually. Immediately after washing. You are washing 2x per day, right? We know this sounds "un-manly", but you really need to be gentle to your eye area. To apply cream to your eyes, just "gently tap" it everywhere from below your tear duct all the way to the start of your eyebrow. *And your mom was right: Rubbing is bad for your eyes. So tap, tap, tap. Use your Eye Rehab every single day. Morning and evening. DIRECTIONS: Apply (tappity tap tap) to orbital eye area 2x per day. INGREDIENTS: Purified water (aqua), Paraffinum liquidum, Cetearyl alcohol, Cyclopentasiloxane, Dimethicone, Caprylic/Capric triglyceride, Isopropyl myristate, Carnitine, Caffeine, Ruscus aculeatus root extract, Butylene glycol, Chenopodium quinoa seed extract, Squalane, Hyaluronic acid, Polysorbate 60, Phenoxyethanol, Ethylhexylglycerine.